Recently, BF and I returned to 5 Burro Cafe – for lunch this time, and it was completely empty. A total turnaround from all the times at night I’ve tried to stumble in for a bite, when it’s totally, totally packed. 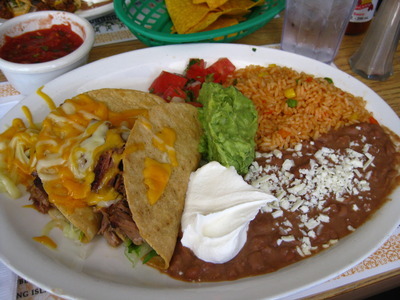 Lunch is a bit cheaper, but still a ton of food; it offers 2 tacos instead of 3, for example. Above is BF’s hard tacos with seasoned ground beef, which he really liked and finished the platter. I requested hard tacos as well, but with the ‘tasty pork & cilantro’ – which I love here – instead of ground beef. And my goodness, it was, per usual, super delicious. 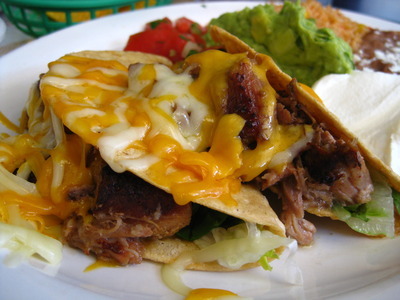 I love how super soft and flavorful the pork is, and with the crunchy taco shells, really good. Admittedly, it is slightly better with the soft corn tortillas a la last time, but I really do not like soft corn tortillas all that much… will have to give it another go to make a final decision (or ask if they have flour tortillas!). Lunch specials are totally worth it; even though BF was able to mostly finish his platter, I totally took food home again and had a nice second meal later. Yvo says: I may have to just start coming here for lunch more often – it isn’t that far from where I live, afterall. Nomnomnom, I really like the food here and will continue to eat my way through the menu!!! 5 burros is really good. 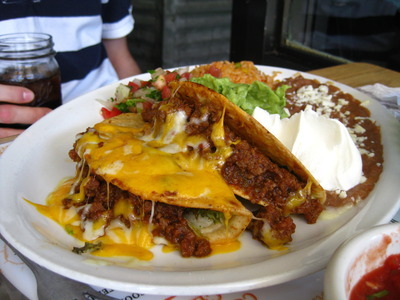 Since you’re in forest hills, you should go north a bit into Corona to Tortilla Nxtimal. Really some of the best Mexican food I’ve had in Queens. A bit of a pain to get to though. Even though it’s not far you’d probably have to drive. Wow. That looks great Yvo! MMMM! No mini margarita?? Boo! But i never tried their pork. I think i have to start expanding my tastes at 5 burro. looks really good!